Kicking off your new week with a new review, Air Mail previously launched on iOS devices all the way back in 2012. Now, Air Mail makes a landing on the Nintendo Switch. 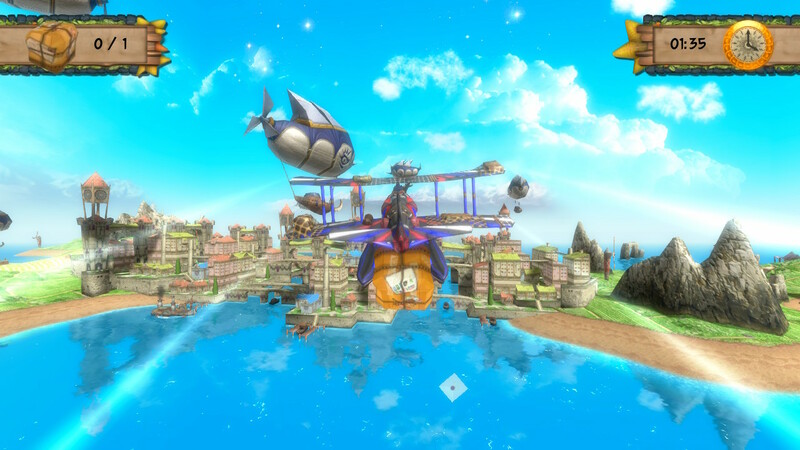 Let's take to the skies and see how this enhanced mobile game fares on Nintendo's console/handheld hybrid with the SuperPhillip Central review! 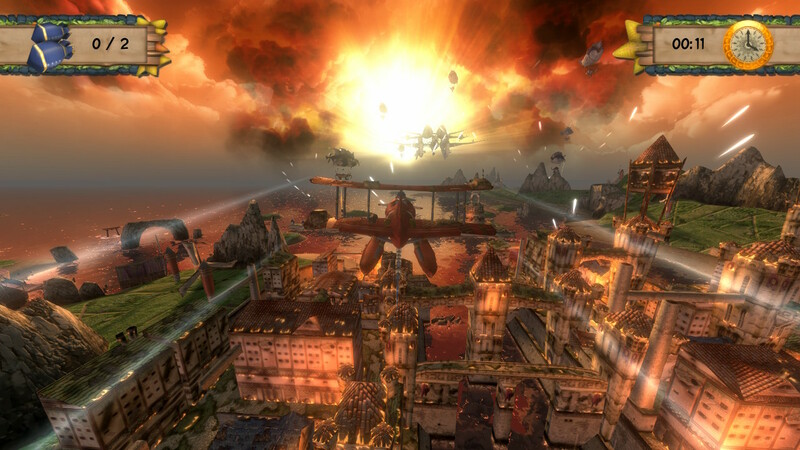 Air Mail originally released on iOS in 2012. In gaming years, the game is considered ancient. Now, like many mobile games, Air Mail has now touched down and landed on the Nintendo Switch. With vastly improved visuals and analog controls available, do these changes make the pricing discrepancy of the mobile and Switch versions less of a shock to the system (and the wallet)? There are three main modes within Air Mail, the first being the campaign, told through cleverly done, semi-animated scenes. The characters you come across in Scoop's adventure are fully voiced, giving you a briefing before each of the game's 25 missions. The actual variety of the missions leaves a good deal to be desired, offering very similar "go here, fetch this, bring it back to a specific location, and then land" objectives. It isn't the latter half of the game where Air Mail presents more challenging missions, such as having Scoop fly his plane through a war-zone, evading enemy bullets that can take him down, or collecting a specific number of diamonds or fruit before landing. Don't mind Scoop here--he's just enjoying the sights of Domeeka. What would otherwise be breezy missions to complete are made more challenging (though, slightly so) with Air Mail's point system. Depending on how well you perform during a given mission, you earn points that add up to a score out of 100, with obtaining 95-100 points presenting you with a five-star ranking on the mission. In order to do well, you have to fly with precision--hitting the absolute center of rings, or picking up cargo from the ground perfectly--as well as complete a mission quickly enough and without taking too much damage. In addition to just scoring well on missions, the campaign mode also has 25 Golden Monkeys, one in each mission, to find as a fun, optional task. Doing so will unlock one of Air Mail's seven or so paint jobs for Scoop's plane. 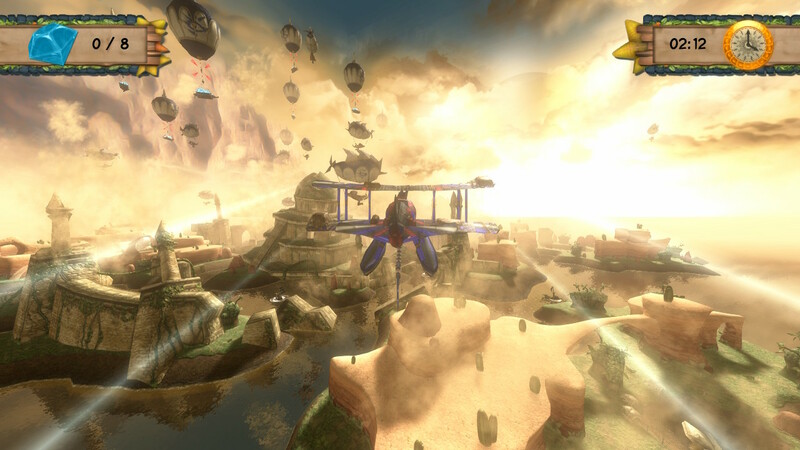 The mode to unlock the majority of Scoop's plane's paint jobs, however, is Explore Mode, a much more easygoing, exploration-based flying affair. Locations unlocked via the story mode allow you to fly around them, spotting points of interest and collecting one of 20 scrolls in each locale. In doing the latter (specifically collecting all 20 in a location), you unlock a brand-new paint job for Scoop's plane. Most scrolls are simple enough to find, but others require some fine sleuthing to uncover. You may have 16 out of 20 scrolls, Scoop, but those last ones are always the hardest! Finally, the last mode is a Time Attack mode, which pits you against the clock to perform one of two basic tasks. This is all the while being on the lookout for clocks that extend your time, allowing you to aim for an even higher score. Some Time Attacks have you flying through as many rings as possible before time runs out, while others have you nabbing cargo from ground or sea level and delivering it to its proper location, again, while the timer is ticking. This mode is rather fun to play in order to improve upon your highest scores, but if you're not the type of old school player who enjoys doing such a feat, like in the arcade days, Time Attack might leave you twisting in the proverbial wind. because he'll definitely need to wear shades to battle this sunrise! Air Mail is not a combat-based flight game. 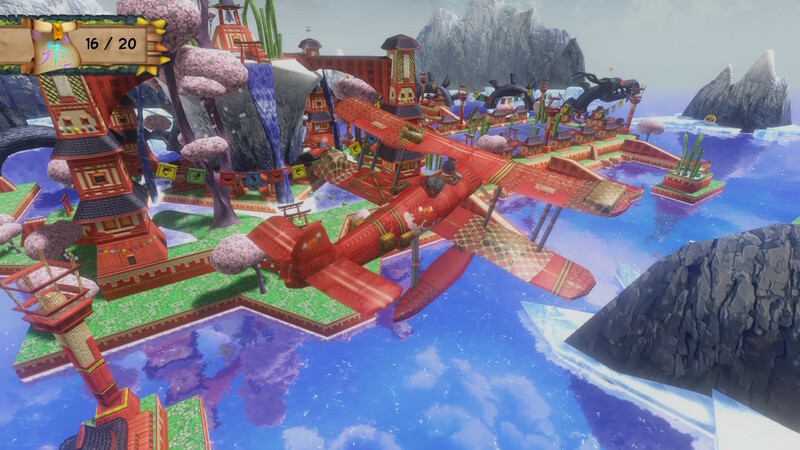 Scoop's plane has no weapons to speak of, except his own plane, used to collide into support cables holding up the nefarious Verakai forces' airships and precious cargo for some story mode missions. Flight is easy to control, but it's also incredibly simple. 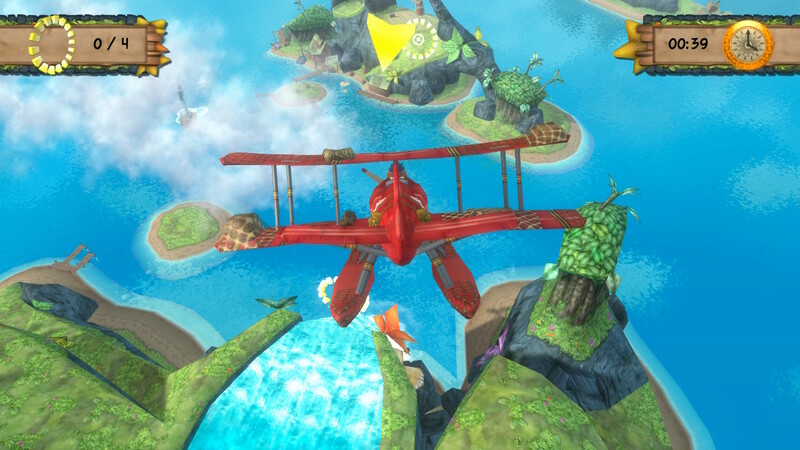 There aren't any barrel rolls or loop-the-loops to come from Scoop's plane. Instead, you have the analog stick to pilot the plane (which the controls can be inverted, if you prefer), ZR to accelerate and to take off into the wild, blue yonder, and ZL to brake and to get ready to land. The titular air mail of... well, Air Mail! I'd be remiss if I didn't talk about the graphical improvements of Air Mail's Switch version compared to the mobile original. Not only has the graphical fidelity improved, but so have building and environmental textures. The dynamic lighting is a sight to behold, delivering some beautiful vistas and scenes on display. Sometimes I would get lost in the plentiful sights that I'd forget about forgo doing the current mission in the campaign. 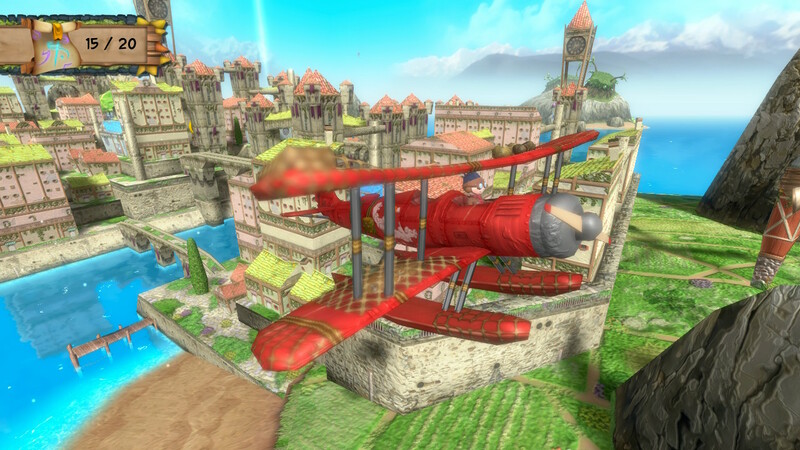 It's a bit astonishing to think that Air Mail was a mobile game from 2012 considering how great it looks on the Switch today in 2018. Even unfriendly skies don't scare Scoop. That said, Air Mail doesn't really rate highly when it comes to delivering a challenging experience, and in addition to that, the mission variety could stand some more mixing up. While not a crash-landing, Air Mail on the Nintendo Switch has first-class pricing for economy class gameplay, making it a little tough to recommend for those with access to an iOS-compatible device Otherwise, maybe you'll want to take flight with Air Mail's Switch version. Review copy provided by N-Fusion Interactive.